Item Code:UN-SP0809 Features:Steel mesh box which all can custom as customers' size. The surface treatment is poeder coating or galvanized. It can be assembly. Steel mesh box which all can custom as customers' size. The surface treatment is poeder coating or galvanized. It can be assembly. Please tell us the size, mesh gauge (100*50 or 50*50), loading capacity, how many layers for stackable, we will send the quotation to you within24 hours. 1. Customized according to clients' demands. Union's Steel Flate Pallet is customzied. Steel pallet is widely used in manufacturing, transportation, removing as well as packing. All UNION steel pallets with powder coating or galvanized are widely used in the food and pharmaceutical industries. 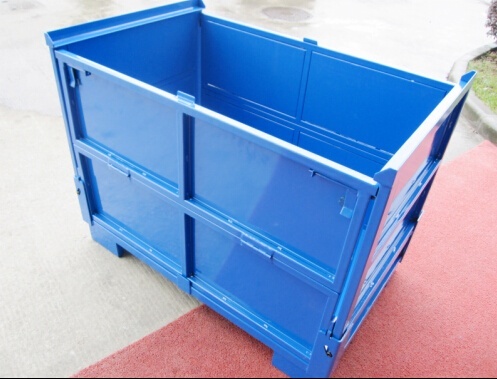 Steel mesh box which all can custom as customers' size. The surface treatment is poeder coating or galvanized. It can be assembly.